UDA HOLDINGS Bhd’s profile will be raised quite a bit with the Government’s plans to develop several pieces of land around the Klang Valley. The company has officially announced that it will be building an integrated mixed development on the former Pudu prison site. The interest surrounding UDA is, to some extent, due to its original mandate given by the Government. Originally a government agency, UDA was formerly known as Urban Development Authority. It was set up in 1971 to promote planned urban development and to elevate bumiputra economic participation in urban areas. The company was corporatised in 1996 with the Minister of Finance Inc as its holding company. It became known as UDA Holdings Sdn Bhd before it was floated on the stock exchange in November 1999. As a listed entity, its role was rather challenging because it had to juggle between commercial and social responsibility. Up to March 2005, Malaysian Resources Corp Bhd was the second largest shareholder in UDA (24.93%) after Khazanah Nasional Bhd (50.01%). Other shareholders included the Employees Provident Fund, Pertubuhan Keselamatan Sosial (Perkeso) and minority shareholders. UDA was eventually privatised by Khazanah Nasional Bhd in May 2007. With the Government’s plans to develop key sites around the Klang Valley, the role UDA will play as a government developer has come up again. These include the development of Sungai Buloh, the Matrade in the Jalan Duta area, Kampung Baru, Stadium Negara, the former Air Force base in Sungai Besi and Dataran Perdana in Jalan Sultan Ismail, near Berjaya Times Square. The Pudu prison site is not Malay reserve land. Even then, the bumi factor has cropped up. It is on this note that UDA chairman Datuk Nur Jazlan Mohamed drew some conclusions between property development and bumiputra ownership. “We must have a mix (in ownership) to do justice to the land value. This is a project for the country. I don’t want to put a figure to it (ownership mix), but there must be a mix,” he tells StarBizWeek. 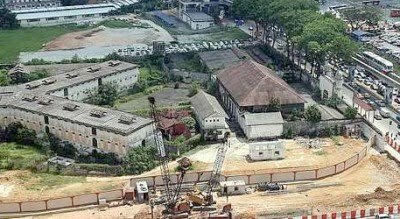 UDA is the master developer of the 22-acre former Pudu prison site. Nur Jazlan, who is also Pulai member of Parliament, became chairman two months ago, after the government announced the development of the former prison site. He was previously with IGB Bhd, Equatorial Hotels and his family’s development business. He also director in several public-listed companies. He says that is a principle that applies to all their projects. For example, a large portion of its Bandar Baru UDA development in Johor comprises bumiputras buyers. So UDA cannot be accused of not taking care of Malays there, he says. He says the former Pudu prison site, located at the junction of Jalan Pudu and Jalan Hang Tuah, will be a social responsibility, and mixed ownership will add value to the land.He says if UDA is able to plan the different components of this mixed development well, they will be able to sell the residential units at a higher price. Nur Jazlan says when something comes with a bumiputra label, there tends to be a discount attached to it. “It is a label people find negative. If you develop Kampung Baru, for example, and put a bumi label on it, there will be a sort of stigma. There will be a discount because only bumiputras can buy and own it. This puts a discount on the land and lowers its value, which in turn results in a cheaper development – and hopefully, not too bad a development. He also brought up examples of other Malay reserve land which have benefited as a result of the development in close-by non-Malay reserve areas. For example, the development at the Curve has raised land prices in Malay reserve Sungai Penchala. Nur Jazlan also says that UDA is very clear about its focus. UDA’s first study of Kampung Baru was done during former Prime Minister Tun Mahathir Mohamad’s time. A subsequent study was done three years ago. Whether UDA will be involved in the redevelopment of Kampung Baru remains to be seen. With the Pudu redevelopment, the company would like to move away from the bumiputra label without forgoing bumiputra interest. “The first and most important question we are asking ourself is: Do we want to rely on the spillover traffic (from other projects around us)? Spillover traffic means traffic from Sungai Wang to Berjaya Times Square, for example. “UDA would like to offer something that will make the city more lived-in rather than just a place to make a living. If we are to have a destination, we will need more residentials,” he says. He says it is possible that between 30% and 40% of the RM5bil project will involve the development of residential projects. Retail and commercial development will take a portion and 1% of the land area will be allocated for open spaces. The plans, to be finalised by year-end, will be defined by the various developments in the city. The two main projects that will directly affect the development of the Pudu site is Permodalan Nasional Bhd’s proposed 100-storey tower at Stadium Merdeka, which is just across the former prison land, and the 34.4 ha development at Dataran Perdana, to be known as Kuala Lumpur International Financial District in Jalan Sultan Ismail, near Berjaya Times Square. “If we can come up with a thematic development, we will be able to draw people to live there. For example, the KLCC area has a park and The Pavilion is a high-end shopping mall. So we have to have a theme for this site to make it a destination,” says Nur Jazlan. Should EPF house our money in real estate abroad?